Could the translucent tyres be removed? The red hubs look like they could work as spindles. I've used cotton reels before for something similar and attached the string by simply drilling into it aned putting in a small wood screw to tie the string onto. It doesn't work. The motors are just not strong enough and the strings have a irregulair slack that makes it tangle around the hubs. All I can do now is concentrate on the head and it's movable parts, and to make it as live-like as possible. I've made a good start on the head. The little red balls are levers that can slide back and forth along the head handle. The balls are attached to metal rods that run through plastic straws, to the inside of the head. Later these rods are going to move the ears, eyebrows and lips. Oh - I wasn't expecting that! How fascinating. I can't wait to see the finished doggy, but the process is so interesting, I don't really want it to stop either! the old Pinocchio style of strings might work somehow? Unfortunately the type of motors used in toys can be rather weak. 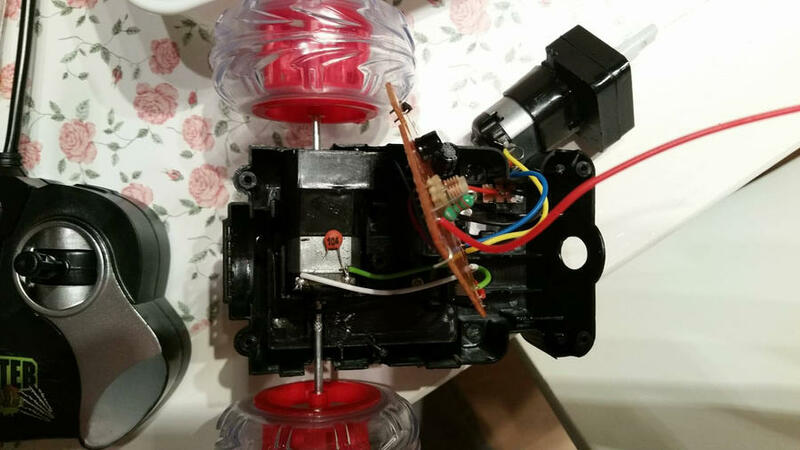 If you decide to give the motor option another try it might be worth looking at the type sold for model robotics as they have a lot more torque. Alternatively, what about doubling up the motors you currently have - use two to drive one spindle? As for irregular slack, might it be possible to build a tensioning spindle along the lines of that used in a bicycle's gearing? I am going to use the string mechanism on the legs, but not for walking. I'm going to put keyrings on each leg-string to manually move each leg seperate. This way I can make it lift all legs when I want to. For instance while sitting, letting it "shake". Meanwhile I've managed to make the ears move and move the mouth. The metal wire works pretty good on short distances. With a drinking straw as an outer cable, it works verry well! I'm about to add foam and (later) fur but I'm not sure if I'm going to keep the moving parts accessable. On one hand I want to make a solid, tight fit flesh and fur. On the other hand I might have to repair some parts later. I think the leg joints are no problem to make them accessable, but the head is going to be a bit of a problem. When all is done, my wife has found a dog groomer who has offered to groom the dog. Small setback and a little progress. The cardboard legs are to flimsy for me to add foam and fur. Especially when the cardboard isn't accessable after it's finished. So I decided to remove the cardboard legs and replace it with PVC pipes. A bit more work, but eventually I think I'm going to be happy with a more durable puppet. I have also had to redo the ears. The joints broke off and the metal ears got warped. This time, I made the ears independently movable. I did a little bit of the foam work. I have found out that hotglue and foam don't go together as it should. It doesn't melt the foam, but the hotglue doesn't set as fast as it should. I think the foam works as an insulator, keeping the glue hot. I have to find a technique on how to glue foam. I have only just seen this thread. Where have I been? What an interesting idea. Looking great so far. Thank you for finding this thread, Corroded Alloy. Perhaps the name of this thread isn't as appealing as it's content. But that's okay. This build is going to take some time, so plenty of time to jump in and have a look. The head is mostly filled with foam. I have to cover the sides where the ears are. The levers can operate the ears indipendantly. So I can put one ear forward and the other one back if I want to. The third lever was going to operate the lip, making it growl. But I decided to go for a more friendly look. Now the third lever is raising the eyebrow. Not a lot, but just enough to give it that surprised/friendly look. In this picture, you can see the chest taking shape. 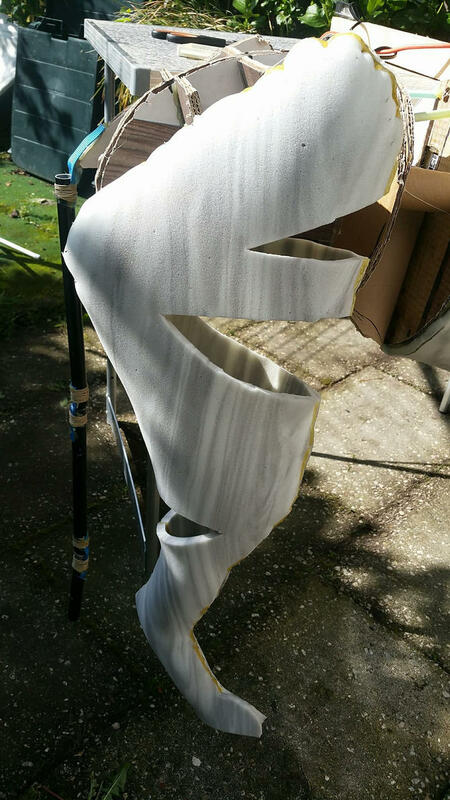 I'm filling it with strips of foam and later I'm going to cover the strips with a 1cm foam topping. You can also see one of the front legs, remade from pcv pipes for more durability. In the top left corner, you can see the base of the neck. It's going to be the hardest part to make. 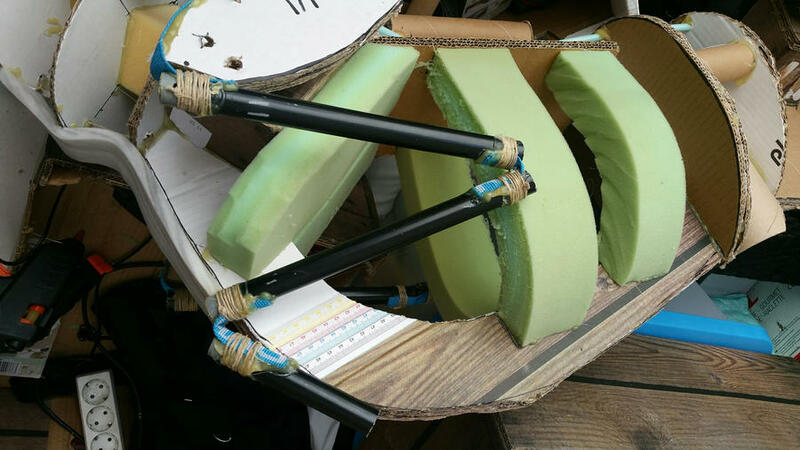 The foam is flexible, but not elastic. Also, the fur fabric isn't elastic. So every movement has to fold in layers or slide over each other. I want the neck to be smooth at all times, so I guess I have to make one part slide over the other. Making the neck area as a sort of bib, sliding over the chest and shoulder area. I guess I'm going to figure that out as I go along. As for the glueing technique: I have found out that a clamp to hold down the foam works. I can now glue one part, while another one is clamped. When the second part is glued, I can remove the clamp on the first one. All done with hotglue. One leg on the operating table. two halfs pinned down with edges against eachother. Pinned down before hot glueing. One leg down, 3 to go! The wedges are to make the foam flex in the right direction. The legs still bend a little bit wobbly, but I think I can contain most of the leg motion with the fur fabric. 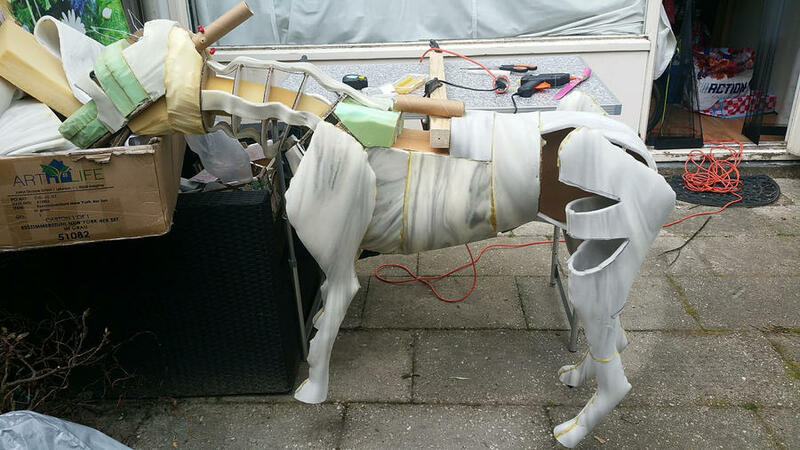 If succesful you might want to try building your own version of "Westworld"
It's almost ready for fur. A few details to attend to and then it's ready. @J. Wilhelm: I think this "Host" might be the first and final make. Although I have some more ideas I'd like to try out. I've finished the paws and added a tail (an old bicycle break cable). 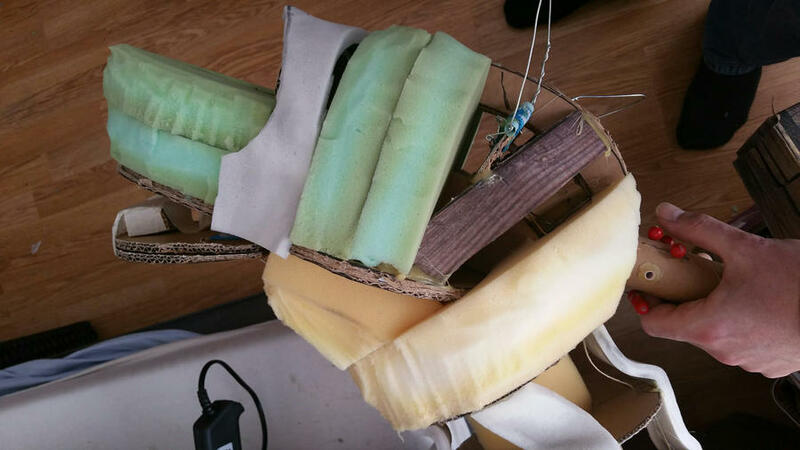 I have also tied some elastic band bitween the neck parts, keeping the strips of foam going outward. Next, I'm drawing out the nap of the fur. Meaning, the direction the fur should go. Mostly, downward but around the eyes and mouth, it should change direction. I would like to keep the internals of the head accesable for maintainance. Probably with overlapping fur or with velcro. Right now, being "skinless" it's looking a little spooky. I'd hate to encounter the creature in a dark alley at night Though it could be converted to a "cyberdog." This started off amazing, and is still amazing! Can't wait to see the fur! With some fake fur, I see that this will be incredible. That is absolutely stunning, a truly remarkable piece of work. Once completed I do hope there will there be video to show the animated creature. 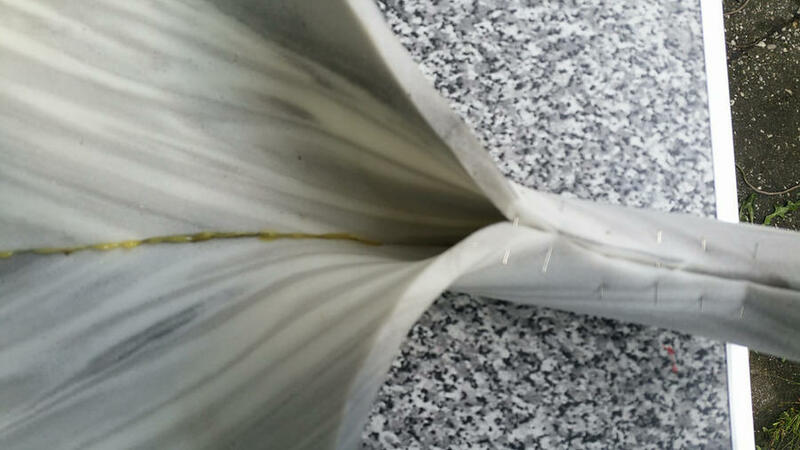 Use a sharp Stanley blade (one of those trapezoid ones) to cut the fabric from behind. Don't cut trough and trough, but only the fabric. 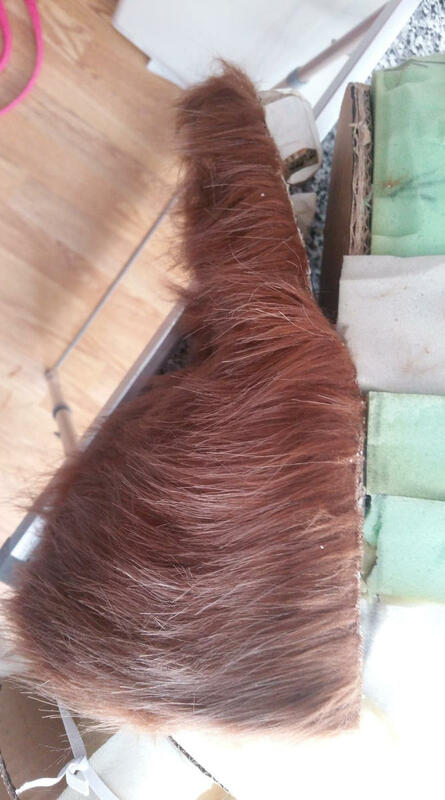 This way, the fur hair stays uncut. 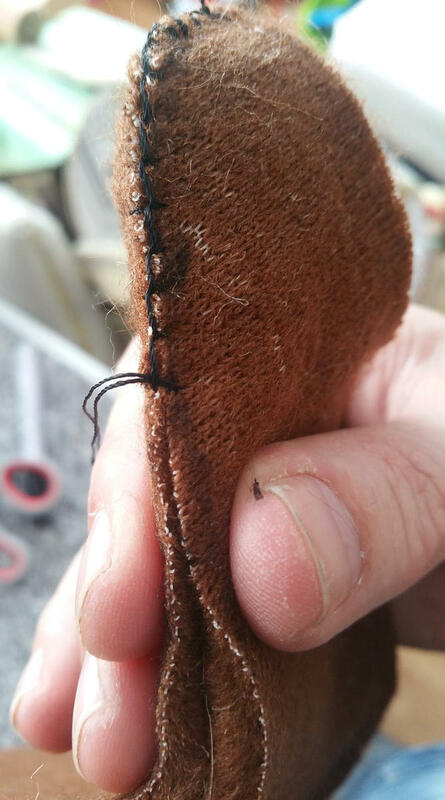 When sewing, sew inside out. 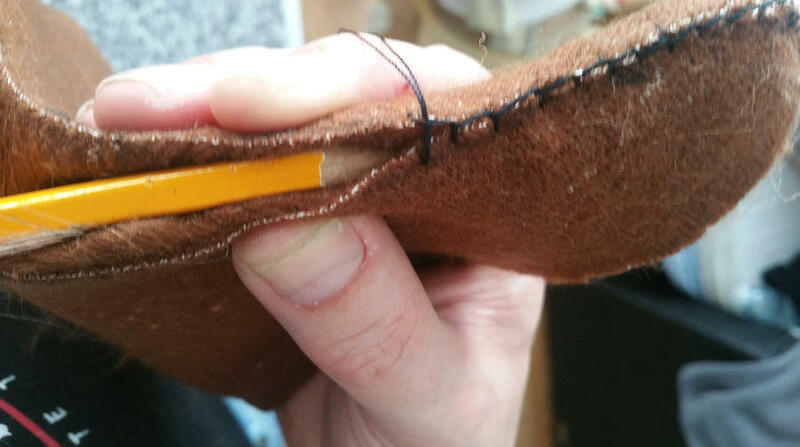 Use a pointy object like a knitting needle or a pencil to push the fur bitween the fabric. 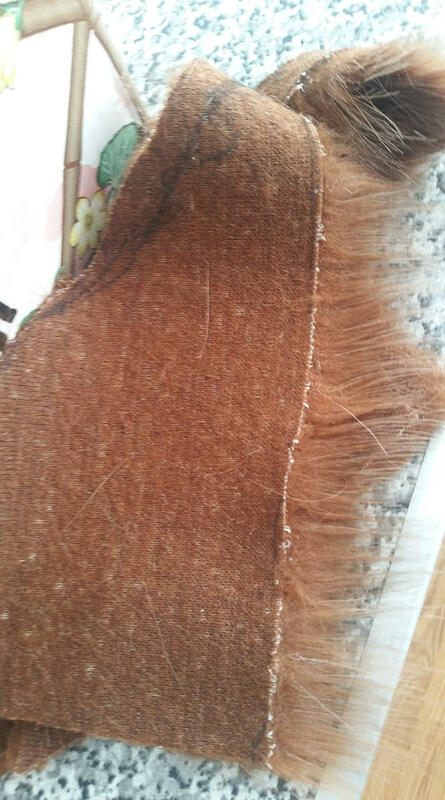 This way, you sew only the fabric, without fur hairs in bitween. I use this stitch, with double strings. To make sure it doesn't break. I don't know how it is called. I stitch through both fabrics and loop through the loop I create. Almost like half a knot with every stitch. 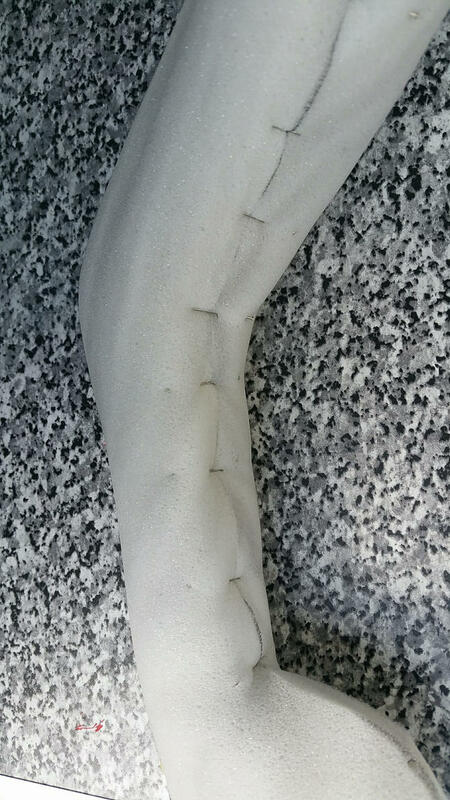 And here is the lower jaw finished. 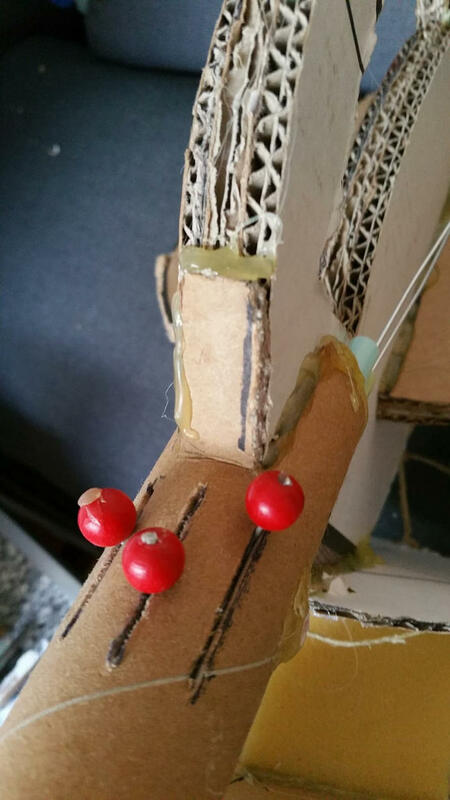 I've glued the fabric on the cardboard jaw with hotglue. I have decided not to finish this build. It's getting way to big and heavy to lift and operate. I have learned a lot from this build. I know how to model foam and fur, so that technique can be usefull for other builds. The foam and fur are still salvageable for other builds, so I have no bad feelings for not finishing the build. I'm not a big fan of furry, but I could make a partial fursuit. It is hard to make the decision to abandon a project you have invested so much time and effort into but sometimes the wisest decision is to move your time and energy elsewhere. I have been there and I have also made the mistake of being too stubborn to make that decision until I had wasted far too much time and effort into a project that I had come to loathe. Night Court - "My Yak Hair Arrived!" *From "Night Court," a 1980s comedy TV show. The protagonist is a young judge, known for being an oddball geek, DIY Maker and fan of 1960s jazz, presiding in a New York City court working overnight shifts and trying cases ranging from the normal (e.g. Involving burglary, prostitution), through to truly bizarre events (eg. The state prosecutor in the court happens to be a known womanizer and letcher, and one time has to buy his soul back from the devil).